Painted in an abandoned house on a mesa new the JTHAR studios, this film and painting series is a meditation on what home is, both negative and positive, abstracted and literal. 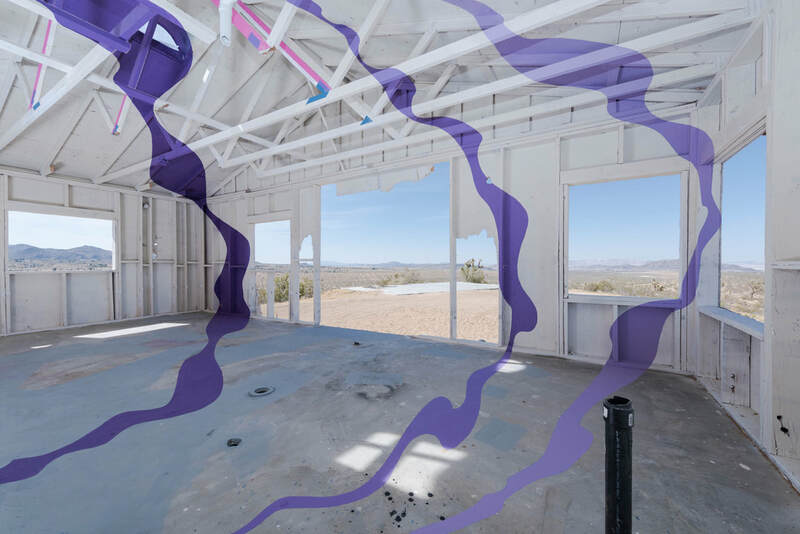 This series of optical illusion paintings on an abandoned structure in the desert examine the many layers of an idea we often take for granted: home. Attempts at defining home, beyond a physical structure, readily invite complication both inner and outer. The paintings themselves can be read in different layers, but the most accessible starting point is to imagine the projection of emotion not just onto a physical space, but onto the idea of home itself. In order to maintain a coherent perspective our emotional alignment must be very precise. One step to left or right and the illusion breaks apart. The uninhabitable structure used in this work is itself unable to be what most would consider acceptable accommodations, suggesting the fragility not just of physical spaces and ideas, but also of the circumstance of home.